I've been dragging my feet as we head into Lent 2018. I'm not feeling terribly motivated on how to fast, sacrifice and give alms this year, and to be honest, hearing about all the books and journals and best-laid plans of others left me wanting to fight against it even more. I'm very rational that way. So mature, so adulty. Yesterday we went to our parish's Family Faith Formation with our kids. Father's talk was geared towards 1-6 graders but I found it really helpful for myself! He reminded us that the way we live everyday (eating what we want, watching what we want, buying what we want, doing what we want) is a dream life for 90% of the world. While we complain about only having one meal and two snacks on Ash Wednesday, so many people only eat one meal a day every single day of their life. Most of us lead such comfortable and excessive lifestyles in America. He mentioned how in some countries, parents go without food for two or three days in a row to give their rations to their children. Meanwhile I'm over here picking the biggest cookie for myself. Mom of the year. He talked about what Lent is (a preparation for Adult Baptism) and guided us through how to pick something to give up. He said that the point of Lent isn't to be miserable, it's to give something up in order to do something better. He also said while we should be working hard not to sin always, Lent is about giving up something good that we can enjoy again in the Easter season. So while we might give up sweets and then dig into our Easter candy, we shouldn't give up swearing for Lent to let loose on Easter morning. Nope, not a good look for a Catholic! 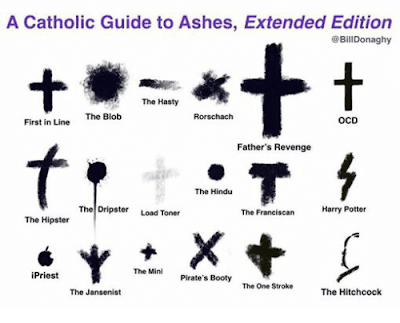 But the best point he made was to say that Lent should pinch. Whatever it is we are giving up, or adding in, should be felt by us throughout the 40 days, like a pinch. It's not knocking us down completely or making us miserable people to be around, but it's enough of a sacrifice to be felt and missed and purposefully given up/added in each day. Yes! I love this! Such a good reminder to choose something that will make us draw closer to Jesus and be better people at the end. I'm in the same boat and woke up thinking "oh crap, lent cometh and I ain't got a plan!" Well, I already have my BIS journal and today I'll sweep away the few winter décor things and add purple and lent-y looks. BUT, I'm still stuck on concrete pinches (love that!). I'll work hard to get that sorted out today. Eek. May your Lent be fruitful, prayerful, and the pinch felt just enough to feel the sacrifice.